All our boxes are decommissioned and when they arrive they are often in a terrible state and in need of major refurbishment. Those in the worst state are sand blasted to strip them back to the bare iron. Following this, maintenance in carried out on the lock, to ensure its security. 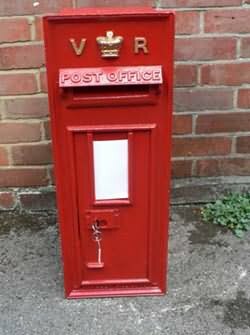 Each Royal Mail post box has a unique 5-lever Chubb lock - the key number is not repeated - and it is almost impossible to pick. 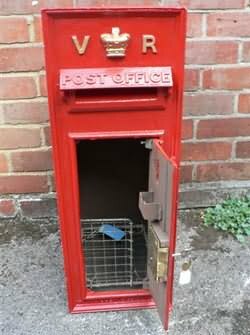 Once essential maintenance and repairs have been carried out, the box is then painted by hand using genuine red paint, to the correct specification. This means that generally only the outside of the box is painted, and the paint will last for 10 years. We do not spray-paint the boxes. Only the Royal Cypher is painted in gold. Each box is restored as near as possible to its original specification. 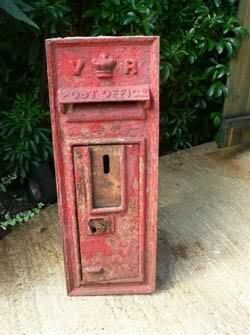 If you are looking for a personal restoration project, we can supply post boxes 'in the rough'. Please contact us for more information.